in the last month or two, a new tradition has been born in our household: sundays are slow-cooker days. most sundays the tv is tuned to NFL football all day, + i bounce between watching football with my husband, + cooking/baking in the kitchen. slow-cooker meals are perfect because i can prep them early, get everything in the crock-pot, then plug it in out of the way so i still have lots of room in the kitchen to bake, cook, + photograph to my heart’s desire. this slow-cooker tex-mex chicken was my sunday crock-pot meal a couple weeks ago + holy moly, it was DELICIOUS! it’s amazingly tender, with a wonderful combo of savory spices + bright citrus flavors. i first used it to make corn tortilla soft tacos, served with mexican tomato beans + rice (pictured in the background), which were fabulous. later, we used the leftover chicken, leftover rice/beans, sauteed veggies, cheese + flour tortillas to make burritos, which were even more amazing. so, add another fantastic slow-cooker recipe to your list of ones to try – you’ll love this! heat the oil in a medium-sized sauté pan. add the onion + sauté for 5 minutes. add the cumin, chili powder, coriander, paprika, jalapeño + garlic + sauté two more minutes. transfer this mixture to the slow-cooker. sprinkle the chicken pieces with salt + pepper, + add to the pan where you cooked the onion + spices. sear chicken on all sides + transfer to slow-cooker once it’s seared. once all the chicken is seared + in the crock-pot, add in the lime juice + cilantro. stir everything together thoroughly. cook on low for 3-4 hours, or until cooked through (different crock-pots cook at varying heats) + tender. the chicken pieces will be fall-apart tender at this point – you can either leave them as is, or fully shred, then return to the crock-pot. serve with corn or flour tortillas, or make into a burrito bowl with rice + beans. LOVE slow cooker meals this time of year! My husband would flip over this chicken. My family would love this! Looks great. Love this! Definitely perfect for football Sunday! This chicken.. I have no words. Tender, juicy and saucy. My fave kind AND slow-cooker. I mean, my slow-cooker and I are seriously BFFs at this point and I think she’d appreciate some low and slow chicken lovin’ this weekend. My slow cooker has already been getting good use, but now I have another recipe to add to the list. Thank you for sharing such a delicious recipe (and one I plan on making right away!) I hope you are having a beautiful week! Fast forward a few hours & this sounds like our Sunday evenings (stupid time zones!). Love the tex mex flavours of this. your Sundays sound perfect!! Ours are usually similar I used my slow cooker last night and was once again reminded that I need to use it as much as possible–so easy! Bookmarking this! You have totally sold me on this dish. It looks delicious! Wow. This looks awesomely amazing! I have yet to grab my slower cooker out of storage, but I need to do it really soon! You are killing me with these amazing recipes! you definitely need to get that crock-pot out of storage – i bet you’d come up with some wonderful recipes for it! I love how many slow cooker recipes you’re whipping out these days! Isn’t the slow cooker the best thing ever?? yes, indeed! it is truly one of my favorite kitchen essentials these days. Oh, this sounds wonderful! A perfect slow cooker meal! Slow-cooker Sundays? That’s the best tradition! I really need to start that too. And this chicken looks amazing! And I love how you can eat it with anything and everything. I have to make tacos and perhaps a breakfast dish as well with this! Oh, this sounds & looks incredible! Definitely will give this a try with the cilantro rice you posted! what a great tradition to have! i would definitely be down for slow cooker sundays while watching football in the evenings! this sounds like a wonderful chicken dish to have on a weekend too – lounging around! My crockpot has already been working over time this fall. I usually make my shredded chicken with just chicken and chipolte flavored salsa, but I see the appeal of adding onion and these amazing spices. ooh, i bet your version with chipotle salsa is just wonderful! I love my slow cooker for this very reason! My boyfriend and I eat burritos at least once a week and this chicken would be a great addition. Thanks for another winning recipe! I love the handiness of a slow cooker – you feel so productive and have so much free time at the same time! This looks great, so many ways to use it! slow cooker sundays is such a brilliant idea! i’ve already bookmarked so many slow cooker recipes I want to try from your blog and this one just got added to that list. Mmmmm what time should I be over for dinner next time? Ugh I am STARVINGGGGG. this makes me even more hungry. Sundays sound like heaven at your place Amy. My better half only mildly enjoys he game of pigskin. I really wish these were in my crock pot right now. These look like a great dinner! I was just telling Kevin how much I NEED A SLOW COOKER! It will save my life during the day. When I get home from work, I work on my blog or exercise and I never have time for a fancy schmancy meal. I need one – it will save my life! Love this recipe Amy!! you really should look into getting one, sally! i’ve been using mine at least once a week since i got it a couple months ago, sometimes 2-3 times per week. i’ve loved *everything* that’s come out of it so far! Holy moly! I love your slow cooker series! I’ve borrowed my mom’s slow cooker and am getting ready to dive through your recipes for my meals! This Tex-Mex chicken looks good…! Gosh Amy!! This looks great!!! This is a great reminder to use my wonderful slow-cooker! It’s great for the use of leftover stuff too!! I wish I lived closer so we could have a scary movie night and taco night. I love that you have slow cooker day. After all these posts of yours, I’m really bummed that I broke mine. And these look so good! You’re becoming an expert photographer of things in tortillas. aww, shucks – thank you! i’m working on improving my photography skills, so that makes me happy! mmm, this looks insanely good. these sort of simple crockpot mexican recipes are truly the best! 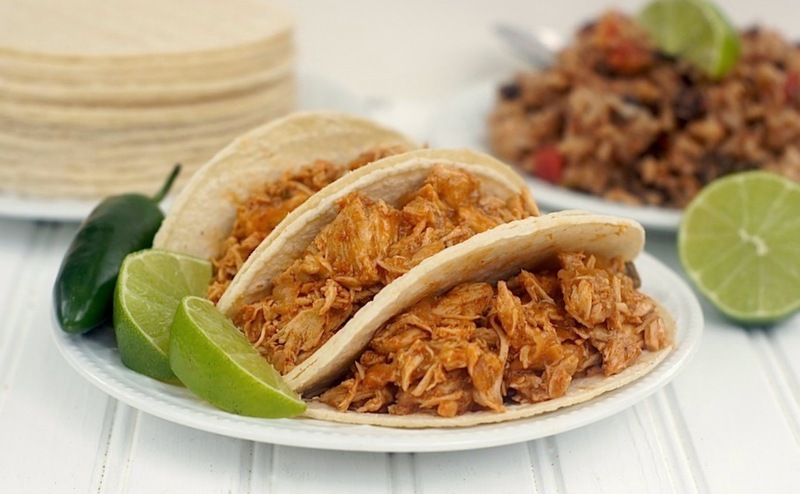 oooo…I love slow cooker and love Mexican…can’t wait to make. Indeed, anything this convenient is awesome and perfect!!! Shredded stuff is perfect for our family as we have 3 kids who like to eat tender ansd soft foods. This will be something that I will introduce to them.